yeah.. am always afraid of their beaks. great solution. nyways, thas good. I like the wolfy part a lot.would like it even better with a neck. nothing says springtime like the birds howling outside your window.........nice job Dave. Yea..filled my bird feeder with milkbones.. I love the lil birdy, it'd be soooooooooooo cute to see a lil wolfy bird outside, a lil scary, but soooooooooo cute! Hehe, I also like how these two were combined so well. I guess he/she won't need to be worried about being attacked by predators...very nice, davinci :). hahaha I looove this! makin me crack up! I can't wait to get internet at home so everyone will stop looking at me like I'm a freak when I start laughing in the library :/ hehehe this is too cute!! this is blended so nicely! looks like the wolf head was supposed to be on there all along! O.o That is very twisted. I like it, yes yes. 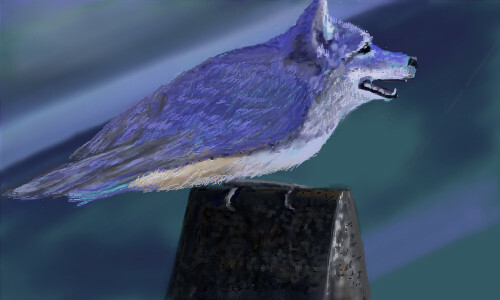 Poor wolfbird. He doesn't know whether to sleep at night and enjoy some nice birdfeed in the day, or sleep in the day and go munch on a deer at night. Oh the woes of natures beasts. Outstanding davinci. But the real question is does he cheap or bark? I suppose he must bark because he has the head of a wolf. I absolutely love this, the colors are so soothing, it makes the wolf less alarming...more like a bird. I know who he is... he's a d.j.... Wolfbird Blue Jay. His primetime on the air is early morning when he peeps, and then during the full moon he howls. He's one rockin' mutant. LOL Cindy, and Qwerty I think he charps. Worht1000 !!! I saw the original, this is great!! Yep! That's where it's from Rubes@! You did a great job with the neck/body transition, making it look like a real dord. <---ha ha.